Did you know you can’t eat your house and have it too? What I am trying to get around to is a conversation about quality and quantity … two things that don’t normally go together without making a conscious and considerable effort to bring them together. Because most projects (and by most, I literally mean just about every single one) have a budget, there are limitations. Few people are aware of where the line exists when budget and desire converge and diverge. Sooner or later, a decision has to be made by the person writing the checks, when they have to decide if they want more, or do they want better … or do they want both? It’s common that during the construction process that people have to make a decision to balance their wishes and desires with the resources it will take to achieve them. Unless you are the owner of the KHouse Modern project. This project is coming together in a very special way because the owner is interested in doing everything in the best possible way. I don’t really want to speak for the client, but when they are faced with a decision, cost and time are normally not the deciding factors … which makes them quite rare and special. Since I haven’t featured an update on this project in a while, I thought I would show the current state of the project. The image above is of the front elevation – and I don’t think this is a view I’ve shown previously. At this point, the house is secure and the security fencing has been removed (I didn’t want to take a picture through the chain link) so this is the front of the house. The orange part on the left is actually building wrap and will eventually be covered in G90 metal horizontal siding. The siding will be one of the last things to get installed on the house, we don’t want it to get damaged by construction workers walking around the job site carrying stuff. If you want to know what the siding will look like, I’ve included a picture a little further down. This house has two garages – this is the one that’s in the front. There’s a second garage off the alley that is towards the rear of the site – recognizable again by the orange building wrap. This is the front entry courtyard – eventually it will contain a water feature and landscaping. If you were to walk up to the front door and then turn 180 degrees, this is the path you would see. There will be a topping slab that will get poured on top of the concrete path you see here – again, this is to protect the finished walkway from the trials and tribulations associated with the construction process. In this shot, I am in the backyard (technically in the side yard) looking towards the Master Bedroom wing of the house. Moving around the rear yard looking back towards the house. The entire rear elevation is floor-to-ceiling glass – very expansive views were always an important consideration in the design of the house. A closer look at the rear elevation. There is a fairly sizable deck that is cantilevered off the back here; eventually there will be guard rails that ring the edge so if any of you were concerned that someone would fall to their death sprained ankle, rest easy. Another look at the rear elevation. The backyard has quite a few really nice trees that all that floor-to-ceiling glass will be able to look upon. On the right-hand side of the picture, you can see the detached guest quarters (orange building wrap). The site falls off fairly steeply towards the back … well, it’s steep for Dallas, Texas. This is a one-story house but because of the grade change, we were able to insert a second garage under the detached guest quarters that would be accessed from the alley. Here’s the lower garage and more of the orange building wrap (which means more of the G90 metal horizontal siding). Something that I’ll talk about later is the cistern that we will have on this project. 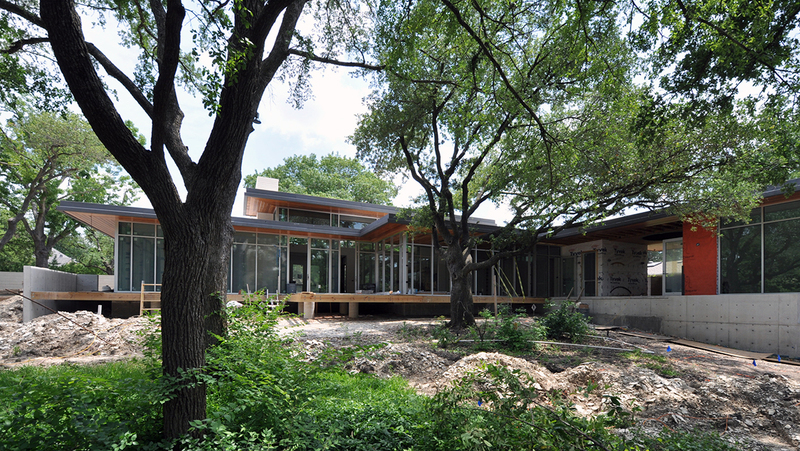 We are aiming for this house to achieve a LEED Gold rating – which would be pretty cool. We have 2 sump pumps on this project, but until the cistern and rain water harvesting system get installed, water gets dumped out into the alley. In case you haven’t heard, we have received biblical levels of water here in Dallas this year. So much in fact, that we have algae growing in the alley. I can’t tell you how unbelievable this picture is … algae. Growing the alley. And a lot of it. Working our way up from the lower garage, there are stairs that will get you up to the grilling porch (or as I like to call it, the “Oculus Porch”). That last step seems like a doozy, doesn’t it? Relax, the flat work (non-structural concrete, i.e. driveways and sidewalks) hasn’t been poured back here yet. We are now in the grilling area Oculus Porch. This is where the contractor is starting the installation of the G90 metal horizontal siding. We are treating this as a mock-up to approve the installation detailing. Here is a good look at G90 metal siding. It’s a dark gray steel siding that has a hot-dip galvanized coating – the “G90” designation simply means that there is .90 oz/square foot of coating – which would be .45 oz/square foot on each side. The interior finishes are coming along nicely but I haven’t spent much time focusing on them. The picture above, I am standing adjacent to the open kitchen looking in towards the main living room. Still in the kitchen, you can get a better sense of what the room will be like with all the floor-to-ceiling windows. The light quality in these spaces is pretty remarkable – there aren’t any lights on in these pictures and you can see just how bright the space will be. If you were to walk the front door and turn in to the room, this is what you would see. The wood flooring is in place – 6″ wide rift cut white oak boards – just in case you wanted to know. Continuing my swing through the main living room, you can see the front door to the left, and the kitchen just beyond (Bulthaup cabinets with SubZero and Wolf appliances). Looking back towards the kitchen – the installation isn’t quite complete yet. There is painting going on so all the floors are being covered up with protective paper and plastic. It makes for boring pictures, but it’s an important part of the process. Just another look at the main living room. This is an incredible room – one that I would like to have for myself. How would you like your house? Hopefully with a glass of milk.